When it comes to cloud computing, there’s certainly no doubt about the fact that’s it’s become the best solution for problems faced by modern businesses. From increased flexibility of working environments to cost saving methods, there’s a lot to gain from switching your company’s systems over to cloud computing. Many businesses have dived straight in with cloud based storage and apps and embraced this great technology, while on the other hand, others are still a little unsure about jumping on-board. So if your business is still feeling slightly hesitant, we’ve took the liberty of outlining some of the most commonly mentioned doubts and myths about cloud computing, in the hope we can provide a few answers to your concerns. In certain situations yes, swapping over your systems can take time. Of course the transition will always depend on the complexity of your previous systems and how much data will need to be transferred. This may result in two systems running concurrently for a while. Overall though, most transfers are done quickly and smoothly. Let’s not forget, once you’ve made the switch, the centralised storage & processing of information will make everything more efficient in the long term. 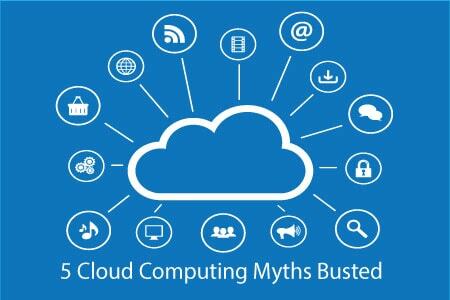 This is after all, the main reason that many businesses decide to adopt cloud computing in the first place. Web applications are always designed to be intuitive and user friendly. This means you should find that both installation and navigation are relatively straightforward with little help or expertise. Of course if something was to go wrong along the way, the cloud-based software applications generally offer support for an additional fee. So if your skills are lacking in-house then you can get the professionals on board to help you tackle any technical problems quickly. Possibly one of the largest concerns our customers have when moving to cloud computing is unreliability. As the business data would be accessed through the internet, then what would happen if the internet connection fails? Well in such an event, there’s no need to panic, all information is backed up on a server and none of your data will be lost. You might be surprised to learn that web applications are often more affordable than you might think. Remember, there’s no need for expensive hardware and with free timely updates, investing in cloud computing can actually save you money in the long run! When businesses access and hold any customer data, of course they have a duty to protect it and actually, storing such information on the cloud, is one of the safest ways to do so. From firewalls to passwords, you’ll be able to rest assured knowing that crucial files are at much less risk from cyber-attacks and instead much more secure. If you’d like to learn more about how cloud computing could help your business or how to make the switch over to the cloud, we’d be happy to help. Call Advance Computer Systems today on 01904 691 311 or click here.